It's actually exactly the same as the original, portrait-orientated edition, except housed in a landscape slipcase so that it's perfectly aligned with your other small-hands editions. "Which one of you touched my bum?" The bad boys have hidden in the science lab's fume cupboard. There's something very strange about that fume cupboard, and it will lead to a forked road - but a forked road to where?!? 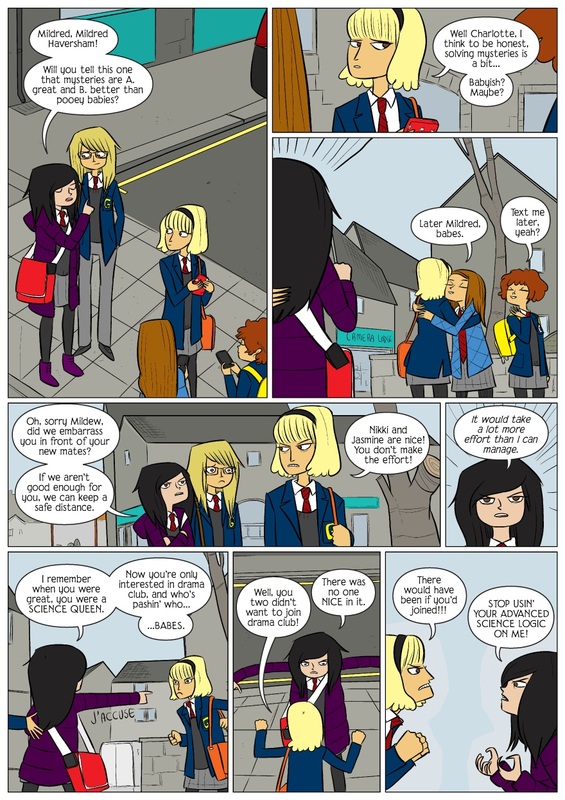 We've written extensively and in depth about all things John Allison (GIANT DAYS etc) so if you want a more detailed analysis of Allison's comedy craft try BAD MACH 6 or the BOBBINS one-shot, Page 45's biggest-selling comic of 2016. He is the British king of gesticulation, whether it's arms aloft in exaggerated exasperation / despair, hands clasped round cheeks for wide-eyed adoration / wistful daydream or Linton tugging at his own tie, just below the knot, in preparation for some action /super-sleuthing, like the proverbial girding of loins. That particular added-extra would have occurred to so few other artists, and it's what keeps the pages of clean, crisp lines so vibrantly active and alive. 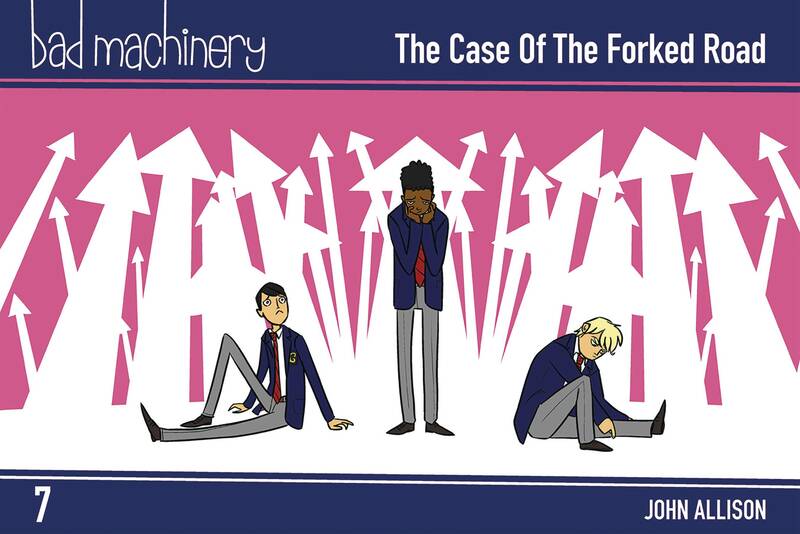 It's all very British and ever so brilliant and BAD MACHINERY itself is all-ages, perfect for those who've grown up reading the likes of LOOSHKIN and BUNNY VS MONKEY by Jamie Smart. However, kids do grow up, don't they, and speaking of fumes one of my favourite albeit brief sequences this time involves Sonny's bedroom. "So, Mildred... did you get much out of him?" "Sorry. He's a bit... you know." "That's all right, Uncle Tom. I opened a window." Sonny lurches out, shoulders hulked high, in nothing but his boxers and vest, a blonde, teenage, monosyllabic Neanderthal, to spray deodorant under his armpits in the bathroom then return, equally unresponsive, to sit cross-legged, frowning at a screen. "Just going to play video games in your pants, then, son? I'll shut the door." In fact, not to disrespect the central mystery - which is ingenious and comes with quite the sly epilogue involving The Beetles (sic) - but most of my favourite sequences this time involve the three lads, Linton, Jack and Sonny, who sit most of this session out while they hit or "catch" puberty, experiencing its own mysteries in hilarious single-panel growth spurts, beautifully drawn, before coming out of their hormonal chrysalises as three different varieties of a classic subculture. In this, as in everything, Allison actually thinks to maintain their distinct individuality where other, lesser creators would have dressed them all up the same. And it all works so well: of course Linton, Jack and Sonny - specifically they - would emerge into young adulthood as modern iterations of that particular British subculture! 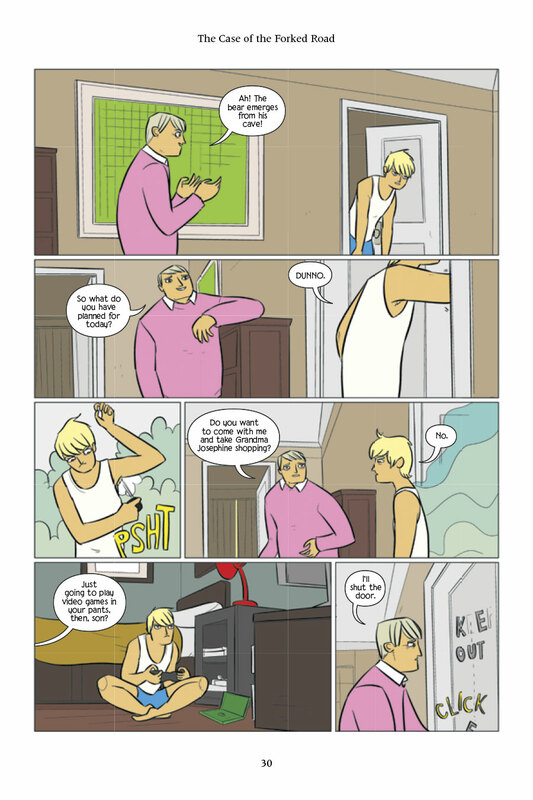 Now, you may think puberty an unsuitable topic for what has been so far an all-ages comic but a) I don't think so (there was way too much misinformation in my day filling the void that is British reserve, reticence and outright embarrassment), but also b) the references are both fleeting and innocent, plus 3) the youngest most people start in on BAD MACHINERY is aged 12, and even if you begin aged 10, most kids will be 12 by the time they reach volume 7. See also a) and b) if they can't really wait. 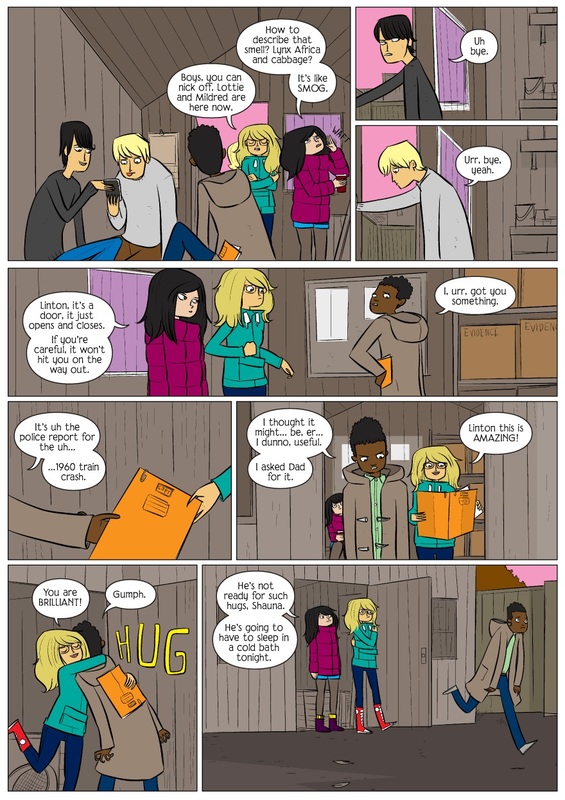 It's very much like Jeff Smith's BONE in that what starts off as a light-hearted comedy comic which children as young as 6 adore grows ever darker as it gets older, but its readers grow with it too. 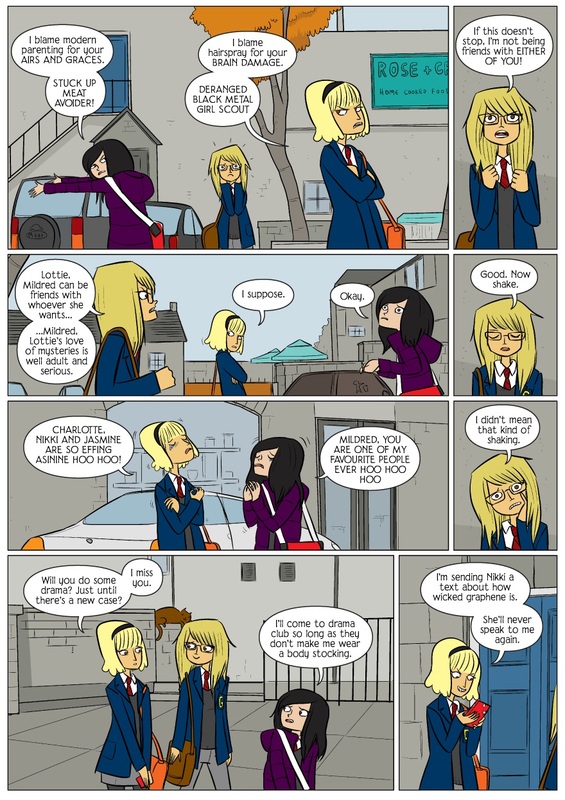 As to the girls, Charlotte, Shauna and Mildred, of course they handle things better - with books and the like - but then they've got their mystery-orientated minds focussed elsewhere. Haven't they? "Mildred. I... are you all right?" "I saw something strange yesterday evening. But I need to ask my dad about it." "Was it a daddy cow on top of a mummy cow in a field? Because you don't need to ask your dad. I will lay it on the line for you." Again, see BAD MACH 6 for what I love about Lottie's language (it amuses me to refer to this series as BAD MACH - it sounds like a blunt and so defunct razor, or a hypersonic speed completely out of control), but here we are treated to "Britane", "Laaa! ", "MENTILE!" and "the BECHAMEL test". "Right, so if you make a film with two ladies in it, and all they do is talk about MEN... it fails the BECHAMEL test." "Yeah. It means your film is bland and cheesy." Meanwhile there are as ever strange "doings" to discern, cogitate upon and pursue to their logical conclusions, like why a young boy has appeared at Griswalds Grammar School in Tackleford wearing a school cap and shorts when nobody wears shorts and even Shauna wears full-length trousers rather than a skirt. Did you spot that she wears trousers? Details! John Allison's characters are all individuals, and he is all about the details. Pay attention to Occam's Razor early on too! "Why is this case 80% CROSS COUNTRY RUNNING? We were so close to CAKE!" * It's the Bechdel test. As in comics' Alison Bechdel of FUN HOME etc.